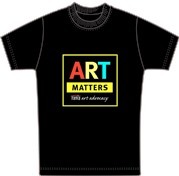 The International Art Materials Association (NAMTA) supports and advocates for the Visual and Creative Arts. 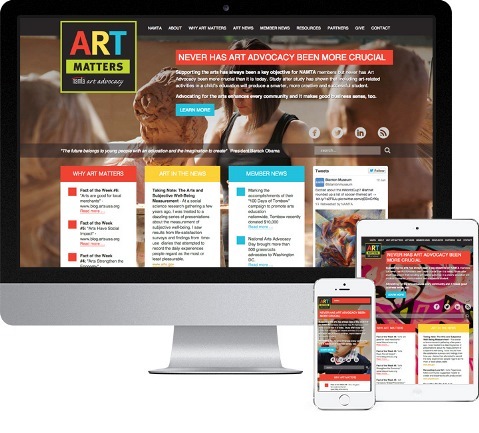 With this eNewsletter and Namtaartadvocacy.org, Namta creates awareness of how its members and other organizations support art in their communities and businesses and with resources and news. 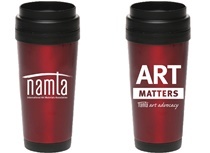 NAMTA has partnered with organizations who are dedicated to Art Advocacy in many aspects of legislative issues, funding, and art education and helps these organizations spread the word on the current issues and how you can make your voice heard. NAMTA partners with Americans for the Arts whose mission is to build recognition and support for the extraordinary and dynamic value of the arts and to lead, serve, and advance the diverse networks of organizations and individuals who cultivate the arts in America, and with Americans for the Arts Action Fund, a national arts advocacy organization dedicating 100% of their time, money, and political clout to advancing the arts in America with a mission is to mobilize one million citizens to join them in support of the arts and arts education around the country. Arts unify communities. 72%of Americans believe “the arts unify our communities regardless of age, race, and ethnicity” and 73 percent agree that the arts “helps me understand other cultures better”—a perspective observed across all demographic and economic categories. Arts improve academic performance. Students engaged in arts learning have higher GPAs, standardized test scores, and college-going rates as well as lower drop-out rates. These academic benefits are reaped by students regardless of socio-economic status. Yet, the Department of Education reports that access to arts education for students of color is significantly lower than for their white peers. 91 percent of Americans believe that arts are part of a well-rounded K-12 education. Arts strengthen the economy. The production of all arts and cultural goods in the U.S. (e.g., nonprofit, commercial, education) added $764 billion to the economy in 2015, including a $21 billion international trade surplus—a larger share of the nation’s economy (4.2 percent) than transportation, tourism, and agriculture (U.S. Bureau of Economic Analysis). The nonprofit arts industry alone generates $166.3 billion in economic activity annually—spending by organizations and their audiences—which supports 4.6 million jobs and generates $27.5 billion in government revenue. Arts drive tourism and revenue to local businesses. Attendees at nonprofit arts events spend $31.47 per person, per event, beyond the cost of admission on items such as meals, parking, and babysitters—valuable commerce for local businesses. 34 percent of attendees live outside the county in which the arts event takes place; they average $47.57 in event-related spending. Arts travelers are ideal tourists, staying longer and spending more to seek out authentic cultural experiences. Arts spark creativity and innovation. 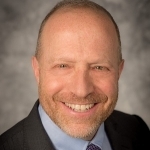 Creativity is among the top 5 applied skills sought by business leaders, per the Conference Board’s Ready to Innovate report—with 72 percent saying creativity is of high importance when hiring. Research on creativity shows that Nobel laureates in the sciences are 17 times more likely to be actively engaged in the arts than other scientists. Arts have social impact. University of Pennsylvania researchers have demonstrated that a high concentration of the arts in a city leads to higher civic engagement, more social cohesion, higher child welfare, and lower poverty rates. Arts improve healthcare. Nearly one-half of the nation’s healthcare institutions provide arts programming for patients, families, and even staff. 78 percent deliver these programs because of their healing benefits to patients - shorter hospital stays, better pain management, and less medication. Arts for the health and well-being of our military. The arts heal the mental, physical, and moral injuries of war for military service members and Veterans, who rank the creative arts therapies in the top 4 (out of 40) interventions and treatments. Across the military continuum, the arts promote resilience during pre-deployment, deployment, and the reintegration of military service members, Veterans, their families, and caregivers into communities. "For a third-straight year, the Administration has proposed to eliminate the National Endowment for the Arts (NEA), the National Endowment for the Humanities (NEH), the Institute of Museum and Library Services (IMLS), and the Corporation of Public Broadcasting (CPB). As misdirected as this proposal is, we are confident that Congress - as it has done in the past two fiscal years - will again reject this short-sighted budget request in a bipartisan, bicameral manner, and increase funding for the Endowments. Will you contact your member of Congress today to urge them to reject the president's proposal? In the past two years, Congress not only dismissed these initial calls for termination, but in fact gave steady increases in funding to several cultural agencies." If you are not already a member of American for the Arts Action Fund, click here to join. The National Art Action Summit/Americans for the Arts is an opportunity to receive crucial advocacy training from experts in the field and then put that training into practice on Arts Advocacy Day on Capitol Hill. Hosted by Americans for the Arts in partnership with over 85 national arts organizations, Arts Advocacy Day is the largest gathering of its kind, bringing together a broad cross section of America's cultural and civic organizations. Grassroots advocates from across the country come to Washington, DC to meet with their Members of Congress to garner support for issues like arts education policy, the charitable tax deduction, and funding for the National Endowment for the Arts. Sue Cohen (second from the left in red coat), from the Namta office in North Carolina recently went to Washington DC for the National Arts Action Summit. Along with contingencies from 48 other states, Sue and the North Carolina team, which included teachers and executive directors of Art Organizations, walked the floors of the Capitol to seek support for legislation on Art and Artist issues bringing their message of Art Advocacy. Pictured is the visit with North Carolina Congresswoman Alma Adams (third from the left, striped jacket), who is a strong and adamant supporter of the arts. Sue's group also visited other NC Senate and US House of Representatives offices asking for the same intentions. Sue said of her visit, "It made me realize the importance of being involved and making our voices heard to our representatives, so they can let Washington know that the budget should always include and support the arts!" Budget 2019 will deliver more arts events in Canadian communities. The Canadian Arts Coalition (CAC) is pleased to see the government commit to a $16 million increase of the Canadian Arts Presentation Fund (CAPF) over two years in the 2019 Federal Budget as well as an impressive amount of other increases for the sector. The CAC advocated for this targeted investment in the creative value chain at Arts Day on the Hill 2018. The Coalition persistently advocated for a CAPF increase in the last year, and we are not alone. Member associations and allies from the Arts and Culture sector made many representations, notably to the Honourable Pablo Rodriguez, Minister of Canadian Heritage and Multiculturalism, and the Honourable Bill Morneau, Minister of Finance. The Standing Committee on Finance backed the sector by calling on the government to increase its funding for CAPF “in order to foster a strong domestic market that will serve as a launch pad for Canadian performing arts productions on international markets.” In addition, twenty-four MPs, as well as mayors and various partner arts service organizations, joined the Coalition’s call by writing letters of support. Another example was their special Neighbourhood Arts initiative150 (for Canada's 150th anniversary in 2017), where they brought together all parts of the community to offer free arts experiences in 21 neighbourhoods – all three levels of government, local businesses, philanthropists, media and over 50 community partners and agencies. 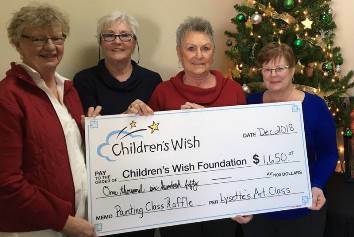 Lysette Art recently conducted a painting raffle, which raised $1,650.25 for the Children’s Wish Foundation of Canada, Prince Edward Island chapter. From left are Mona Reck, Dale Vigneault, Lysette Sampson and Dolores Watts. The Prince Edward Island chapter is currently working on granting 23 wishes for Island children and appreciates the support of these artists. 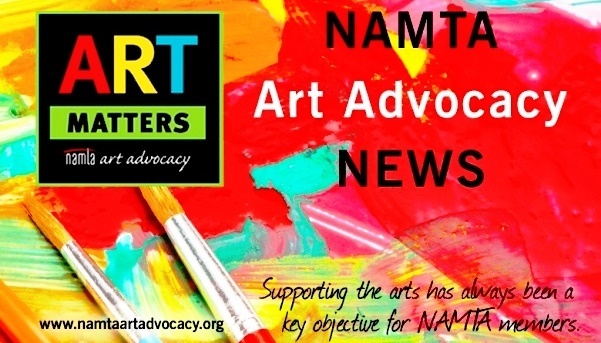 The 2019 Namta Art Advocacy Grant application period will be open from May to July. Namta will send out announcements with a link to the online application when it opens, but be sure to check www.namta.org Home page for updates. Visit this page to see details and the 2018 recipients. See Organizations that promote programs for Public Art, Art Education, The Military, and Health & Healing. In January of 2018, The Art of Education conducted the world’s largest survey of active K-12 art teachers in the United States, asking about everything, ranging from annual supply budgets and length of art classes to how comfortable teachers felt with different media and current educational initiatives. A total of over 2,500 teachers from all 50 states completed the survey, providing an eye-opening look at the current state of teaching K-12 Art in the 21st Century. Most art teachers work in the ‘burbs'. 47% of art teachers work in a suburban setting; 31% are employed in rural schools and 22% in urban schools. Behavior management is one of our most common classroom issues with 46% of art teachers striving to improve in this area. 43% of art teachers report a lack of respect for the art program as another hurdle they face. 1 in 5 art teachers have class periods at or under 40 minutes in length. 3 in 5 have class periods at or under 50 minutes in length. 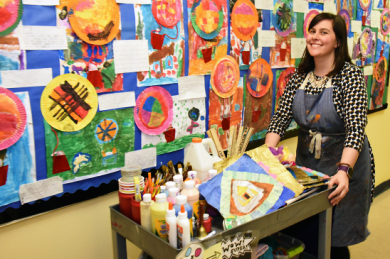 Elementary art teachers instruct, on average, about 500 students per year. Remembering all those names can be a real challenge! Two-thirds of art teachers are the only art teacher in their building. The average number of art teachers per district is 21. 56% of elementary art teachers have average classes sizes of 23 students or less. With the national trend continuing to slide toward larger class sizes, it’s refreshing to see some art teachers instructing smaller groups. Art teachers set high standards. 75% of art teachers follow their state standards, while more than half follow the National Core Arts Standards. There’s comfort in the familiar. Over 90% of high school art teachers are comfortable teaching traditional drawing and painting, while only 28% are confident in leading digital art lessons. 45% of art teachers have over a decade of teaching experience. Alexander Cruz has been a demonstrator for exhibitors at Namta's Art Materials World. Since his childhood, Alexander showed a natural tendency towards the world of arts. Born in Río Piedras, Puerto Rico in 1975, Alexander studied music with his father, Professor Eugenio Cruz and mastered musical skills in instruments such as the "cuatro", a native musical string instrument, bass, piano and recently the guitar. At 15 years old, he studied the "Wet on Wet" technique in oil with the international artist Bob Ross and became the first certified Ross instructor in Puerto Rico on subjects such as Landscapes (CRI), Florals (CRFI) and Wildlife (CRWI). In 2014, The United Nations Educational, Scientific and Cultural Organization (UNESCO) gave recognition to Alexander as an Art Ambassador for his career and international achievements as it has helped to foster the development and arts education for children, youth and adults locally and internationally. Alexander has also worked in countries like Taiwan, Germany, United States, France and Spain with children and adults - especially kids. 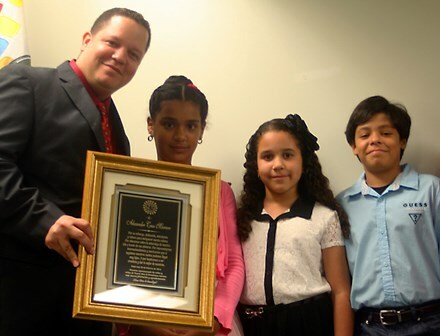 Children representing kids around the world give Alexander his award. Once complete, a series of powerful images will give us a sense of a powerful big picture. At the Charles George VA Medical Center in Asheville, North Carolina, artist Jim Stilwell volunteered in 2017 to take on the Veterans Mural Project that has since evolved into something even bigger than he drew up, with plans to include some 250 feet of art. 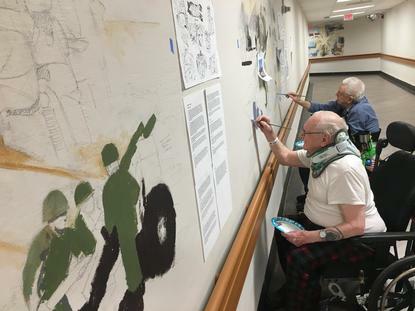 “This is the famous scene from Iwo Jima,” he said, brushing acrylic paint onto what was once a drab hallway at the VA. "Every one of these on this wall is history going back to World War I,” he explained. Jim laid the groundwork by sketching the images in pencil. Then, he welcomed veterans to help fill in the gaps. Searcy was joined by Korean War veteran Bill Thomas. They sat next to each other in their wheelchairs while working on a part of the mural capturing various images of that conflict. "These are early jets that were probably flying about the time you were in the Air Force,” said Stilwell. "It's looking good!” Searcy said. “When I paint, it brings back good memories." "This is supposed to be the carrier that I was on,” Thomas explained. This has become his passion project, to the point that he’s willing to paint through pain. He suffers from a spine-related condition, frequently winced and stopped painting because of his discomfort. “Is it hurting? You wanna take a break?” Stilwell asked. “No I get it,” Bill said, soldiering through. Watching Bill paint gave us a portrait of resilience. "Challenging to know that I can do what I want to do,” Thomas said. “Even though there's a little bit of pain?” this reporter asked. “A lot of pain,” he responded. "But as he gets into the painting, it takes away a lot of the stress and takes them into another place,” Stilwell said. He estimates the mural project is another two years away from completion. For the veterans devoting their time, it’s as much therapeutic as it is artistic. "Yeah, it makes me relax,” Searcy said. "First of all, it's a stress reliever,” Stilwell said. “But mainly, it's an empowerment." Together they transform a once drab hallway into a corridor of honor. No matter what the mission, it doesn't hurt to have a wing man. "You're doing a good job on that one,” Thomas told Searcy. “Thank you, you're doing a good job on yours, too!” Searcy replied. Those moments are part of the beauty of a long work in progress. 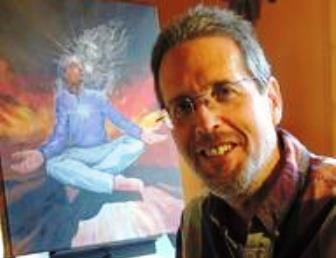 Artist Jim Stilwell resides in the Asheville, NC area and spends almost every day creating or mentoring. Jim also teaches free art classes for veterans on Monday’s at the VA. Visit Jim's website to see more about the Veteran's Mural Project. Did You Know about Dadaism? Dadaism is an artistic movement in modern art that started around World War I. Its purpose was to ridicule the meaninglessness of the modern world. Its peak was 1916 to 1922. It eventually influenced surrealism, pop art, and punk rock. Dada began among artists, writers, and intellectuals who fled to neutral Switzerland during World War I. The movement was a form of protest against the society that allowed the bloodshed to take place. It challenged the perceptions of nationalism, materialism, and rationalism during this “humiliating age”. Like the movement, its name is nonsensical and has no real meaning. One of the foundations of Dadaism is anti-rationalism. It deemed everything as meaningless and pushed for non-art created by non-artists. “Dada” appealed to its founders because it sounded absurd and childish. The Dadaists came in two major groups. The European Dadaists, especially from Switzerland and Belgium, protested the war and authority. The New York Dadaists were especially against the art establishment. Despite difference in focus, both groups defied the mainstream definition of art. They also challenged the creative process and value given to its products. Dada art did not have a single style or medium. The only rule of Dada is not to follow any known rules. Still, Dadaist works shared some characteristics: satire and wit, irreverence, and spontaneity. Dada was an early form of Shock Art. The goal of Dada art was to provoke strong emotional reactions. Its anti-materialistic stance especially aimed to upset the sensibilities of the upper class. The Dada movement ended by design. Dada self-destructed after the war and its reasons for existing ceased to be. Dada had lost its shock value and was becoming accepted into the mainstream. Francis Picabia wrote that the movement was not serious and “if certain people take it seriously now, it’s because it is dead!” Dada ended in its hometown of Zurich during an event designed to end in a riot. A crowd of over 1000 people was roused and encouraged to destroy the props at the venue. The Dadaists considered the crowd’s participation as a final victory for the movement. Dada inspired other movements despite its anti-art stance. Many artists continued along its the bizarre and fantastical qualities to create Surrealism. Dada’s spontaneous and “accidental” art process served as the foundation for Abstract Expressionism. Dada is an absurdist movement that challenged the establishment in art and politics. It created chaos to make sense of the world in the face of anarchy. 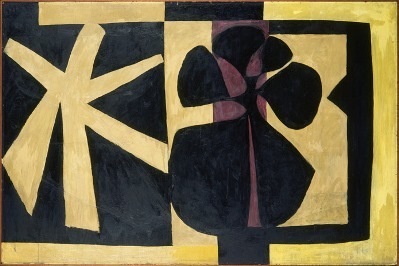 This painting, completed in 1926, can be found at the Nationalgalerie in Berlin. It is a deeply sarcastic portrait of the German elite classes who supported Fascism. Like many of his paintings of this era it satirized what he believed was the corrupt and bourgeois society of Germany. 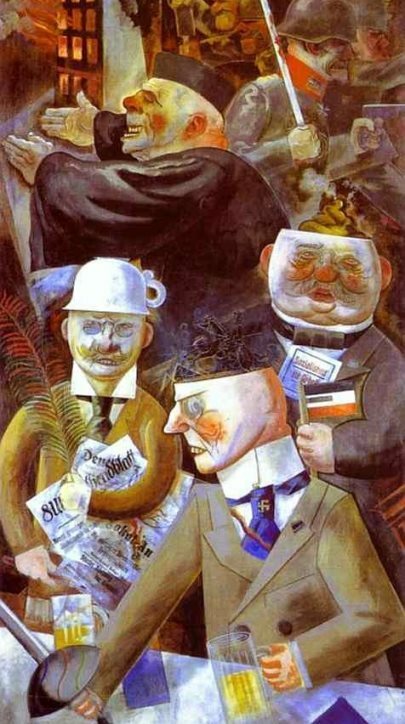 In this painting Grosz uses his skills as a caricaturist to produce vivid, grotesque, nightmarish, portrayals of those who controlled society. Robert Motherwell, Wall Painting III, 1952. Oil on fiberboard.